Our Christening and Baptism Candy Bar Favors and Candy Bar Wrappers are truly unique, and beautiful! Such a special occasion deserves a SWEET treat! 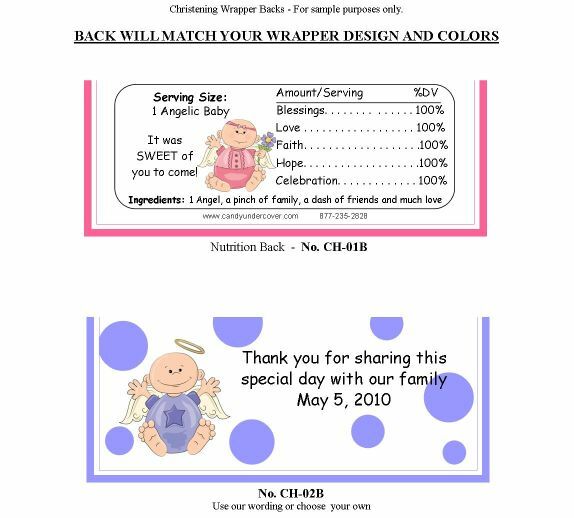 Treat your guests to a chocolate bar covered in one of our beautiful Christening or Baptism candy bar wrapper designs. 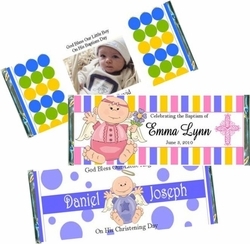 Our yummy candy bar favors will help make your Christening or Baptism celebration even more special. Our wrappers are printed on quality high glossy paper, to make them really spectacular! First we wrap the chocolate bar with silver foil, then we wrap the designer Christening or Baptism wrapper over the foiled wrapped bar. The outcome is a beautifully wrapped chocolate bar favor that your guests will love! For a DIY candy bar favor, order the CANDY BAR WRAPPERS ONLY. We provide the SILVER FOIL underlay and PERSONALIZED CANDY BAR WRAPPERS! *This is for the do-it-yourselfer. We do NOT provide the Hershey candy bars!! *Our candy bar wrapper/foil combo will fit 1.55 oz "Regular" Size Hershey's bars, or Kit Kat candy bars! *Assembly is required by customer *To sum it up: YOU buy the chocolate bars, YOU wrap the chocolate bars with the silver foil provided, then wrap the candy bars with your beautiful personalized Christening candy bar wrapper. Short on time, or the DIY method not for you, then order the fully WRAPPED CANDY BARS. We will do all the work for you! Your Christening or Baptism Candy Bar Favors will arrive to you all ready to hand out to your guests. Any of our candy bar wrappers can say Christening or Baptism. Take a look at our wrapper designs below. If you don't see what you are looking for, just ask! Our designers will work with you to create a custom Christening or Baptism candy bar just for you for a truly unique party favor.